Trekking route in Everest Region has three high altitude passes. They are Kongma La Pass (5,535 m / 18,159 ft), Cho La Pass (5420 m / 17,782 ft), and Renjo La Pass (5,340 m / 17,520 ft). And in this Everest Three High Passes Trek Package, you will be hiking through all these high mountains including a tour of Everest Base Camp and Gokyo Lakes. This adventurous trekking is very challenging and demands energetic physical condition. Another attraction of Everest 3 Passes Trek is hiking to the Kala Patthar and Gokyo Ri. 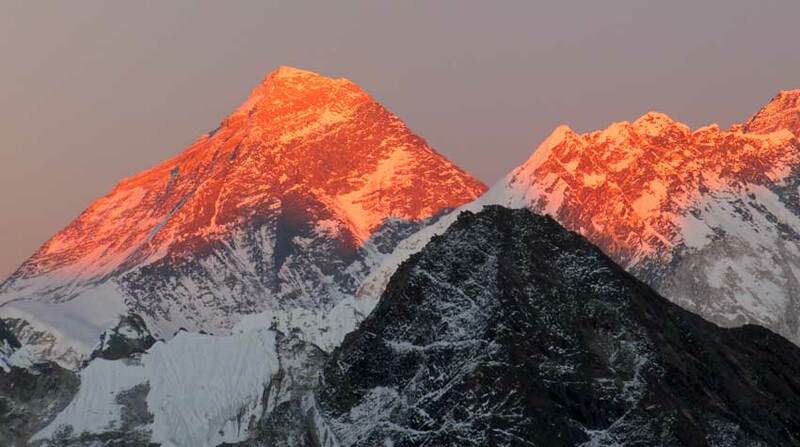 Panoramic lofty Everest range mountains are the charm of these two hill station. Your journey to this high spirited trek begins with a 35 mins stunning flight to Lukla from Kathmandu. After 8 days trekking with proper acclimatization reaches the first and high pass of this hiking, Kongma La Pass. Then, visit Everest Base Camp and continue to cross another pass, Cho La Pass. Explore Gokyo Ri, Gokyo Lake, and Gokyo Village, and pass another final destination Renjo La Pass. Afterwards, trek down to Lukla and fly back to Kathmandu. Day 07: Trek to Chhukung. Day 08: Cross Kongma La pass and Trek to Lobuche. Day 09: Trek to Everest Base Camp and stay at Gorakhshep. Day 10: Hike to Kala Patthar, trek down to Lobuche. Day 11: Trek to Dzongla. Day 12: Cross Cho La Pass and Trek to Gokyo Valley. Trail Attractions: Cross Cho La Pass. Day 13: Acclimatization day at Gokyo Valley. Day 14: Cross Renjo La Pass and Trek to Marlung. Everest Three High Passes Trek finished here! Wants some modification on Everest Three High Passes Trek itinerary? contact us to customize it.